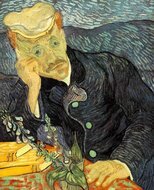 Van Gogh created this painting as an homage to his close friend and drinking partner. The thick brush strokes and rich colours of the painting changed the modern face of portraiture forever. 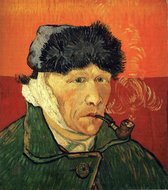 Our team of painters are specially skilled at creating very accurate replicas of Van Gogh’s paintings on canvas. We do our best to be faithful to one of Holland’s most famous artists. The painters highly skilled and educated in a number of artistic techniques including, brush strokes, colour mixing, ambience, and rhythm of application. 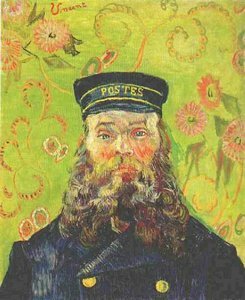 During his time in France, Van Gogh became good friends with Joseph Roulin, a postman in the town of Arles. 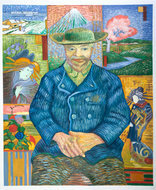 During his stay, Van Gogh made a number of portraits of Joseph and his family. In essence with his own style, he avoided trying for a photographic recreation, and focused on creating vivid colours and aesthetic brush strokes to create his own style. This painting tries to stray from the accepted norm of photographic recreation that is usually present in portraiture. 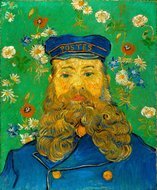 With this, Van Gogh incorporates his own unique style of vibrant colours and thick brush strokes so that the viewer can play with the image in their mind. His ultimate aim was to evoke unique emotions with his viewers so that it wouldn’t be conceived as just another ordinary portrait. 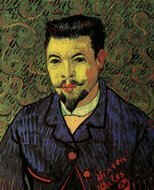 Through his stay at Arles, he captured the entire Roulin family through similar styles, multiple times. To him, the entire family were people who helped him through his struggle to continue his work as an artist. This was his method of thanks and appreciation during a time when he felt emotionally alone.